I am an artist and specialize in intricate wire-woven jewelry. While I create many types of jewelry, my true love is working with extraordinary natural stones and creating specialized, hand-woven bails to complement each stone. Each stone has a meaning and a special purpose. Whether you love the sheer beauty of the stones or their meaning, healing and centering properties, each piece of jewelry has been uniquely designed and is truly like no other. Whether you're looking for a gift or something for yourself, I love working with customers to find the perfect stone and creating a one-of-a-kind piece. If you are looking for a particular stone or want a custom ring, bracelet or necklace, please contact me here. Earth creates the most beautiful stones with gorgeous colors that truly showcase the beauty of the natural world. 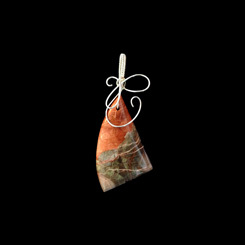 I use all natural stones and .925 sterling silver wire. All pieces made with copper are all natural copper and are treated to help prevent a patina from forming. The leaves I use are real leaves that have been hand painted with copper and dipped in either rhodium or copper. Please contact me if you have any questions regarding the materials I use.